It’s time to talk Premier League, and discuss what Manchester United should do when it comes to finding their permanent manager. We also talk a little MLS Super Draft, and cover some English Football espionage that occurred recently. Our beer of the pod brings a history lesson with as we go try the All Saints Einbecker Ale from Castle Church Brewing Community. This beer is based on the ale that Martin Luther himself preferred, and was very popular in the Middle Ages. This new brewery recently opened here in Central Florida, and is actually a church that is part of the Evangelical Lutheran Church of America. For those of you visiting Orlando for vacation, it’s located near the airport, so plan accordingly. Pouring the beer from this very pressurized beverage bag provided its own comedy. It was the first time we had used one of these. 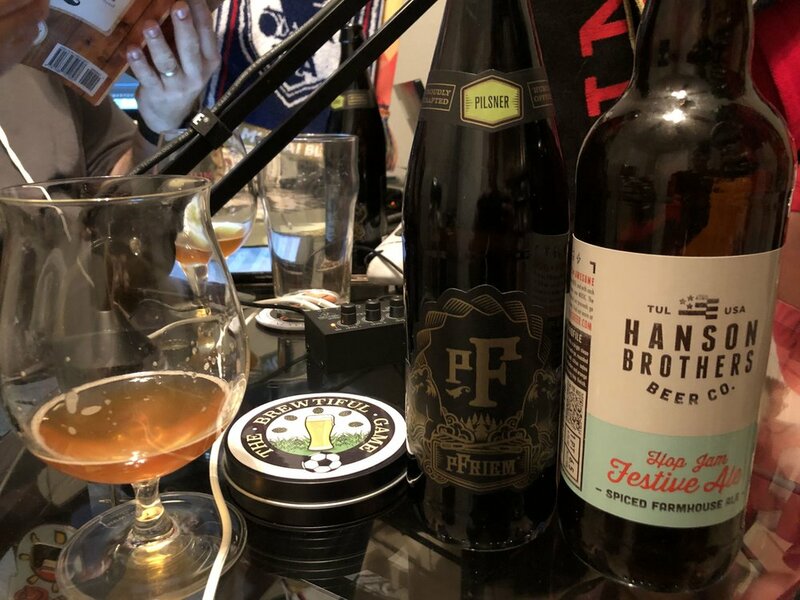 The first beer reviewed in this episode comes from a listener, it’s a delicious pilsner from Pfriem Brewing in Hood River, Oregon. Ferris surprised us with a second beer for the pod, and it is from none other than the musicians of “Mmm Bop” fame, the Hanson Brothers. I can safely say, we weren’t expecting that. Boxing Day is here, otherwise known as Soccer Christmas, and this glorious day gives us tons of Premier League matches to talk about. But let’s get real, the reason we really love the Boxing Day Special, is because we get to try three new Holiday brews. This year is very special, because all of the brews come from three different listeners. Thank you all so much! Our first beer is Doggie Claws from Hair of the Dog Brewery in Portland, Oregon. Not only did this delicious barely wine show up for us, but Matt from Portland gave us his report from attending the MLS Cup match in Atlanta. Thanks for an inside look from a visitor’s view, and for this great beer, Matt! Our next beer is Office Party from Abita Brewing, and the final is The Chocolate Manifesto from Flying Monkeys Craft Brewery. It was a treasure trove of new holiday favorites. We hope you have had a wonderful Holiday season, and are primed to have a very happy New Year. Thanks for joining us for 2018, here’ s to 2019. Slainte! TBG 107: Premier League Week 16 | UEFA Champions League Update | FIFA Women’s World Cup Draw | The MLS CUP! It’s been a busy week of soccer as we roll into this festive season of fixtures. We talk the highlights of last week’s Premier League matches, how things have shaken out to the Round of 16 for UEFA Champions League, the draw for the FIFA Women’s World Cup, and last but not least, Atlanta United being crowned this season’s champion of MLS after a fantastic season. Ron keeps bringing the beers from down under as he brings in a beer from Bridge Road Brewers in Beechworth, Victoria, Australia. It is their super rare holiday seasonal, MAGICAL CHRISTMAS UNICORN Vanilla Ice Cream Ale. Wow! What a beer. As you’ll hear, this one really caught us off guard.